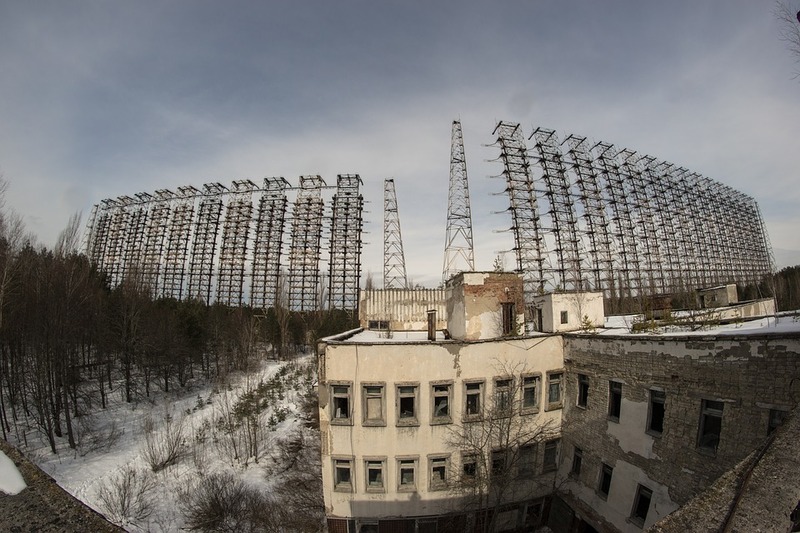 Historian of 'modernist wastelands' Kate Brown talks about the Chernobyl disaster, nuclear cover-ups, everyday heroism and the shadow of the mushroom cloud. Kate Brown came to prominence as a historian with the essay ‘Gridded Lives – Why Kazakhstan and Montana are Nearly the Same Place’, published in the American Historical Review in 2001. She rejected the triumphalism of the end of the Cold War, instead investigating the ways in which the USA and the USSR both resembled and borrowed ideas from each other. She continued this project in Plutopia, a study of atomic cities in the two countries, and in the award-winning A Biography of No Place, on the rise and fall of the Polish Autonomous Region in Soviet Ukraine, and the transformation of one of the most multi-cultural places in Europe into a homogeneous Ukrainian heartland. She talks to Tribune about her new book, Manual for Survival – a Chernobyl Guide to the Future, which has already proven controversial in arguing that the effects of the 1986 nuclear disaster are far greater than is conventionally understood. Manual for Survival has a very international approach to the disaster, bringing in the UN, the United States, Greenpeace and all these international institutions, and their actions; but it’s also rooted massively in one particular parts of Ukraine and Belarus, which are roughly also the places where A Biography of No Place is set. There seems to be a common thread about interventionist projects that on the face of it aren’t sinister – ‘we want to give these people their own republic’, or ‘we want to give them infinite energy’, and then terrible things happen as side-effects of this. 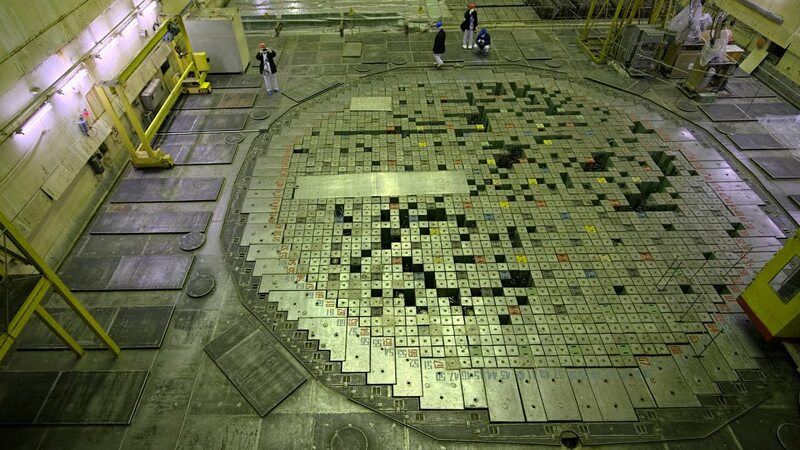 Starting with A Biography of No Place, yeah – I mean, where do you put a reactor? You put it in a sparsely populated area that has a lot of water. Why was this area sparsely populated? Because it was a big swamp that had a lot of water. So these things feed each other. I’ve been drawn for my entire career to what I call ‘modernist wastelands’. Progress occurs in London and New York and Moscow, and historians rarely look at what we’d call the backwater, the margin – but the backwater is where you get the wake of progress, and the wake of progress is often a lot of destruction. So I’ve been drawn to that story over and over. 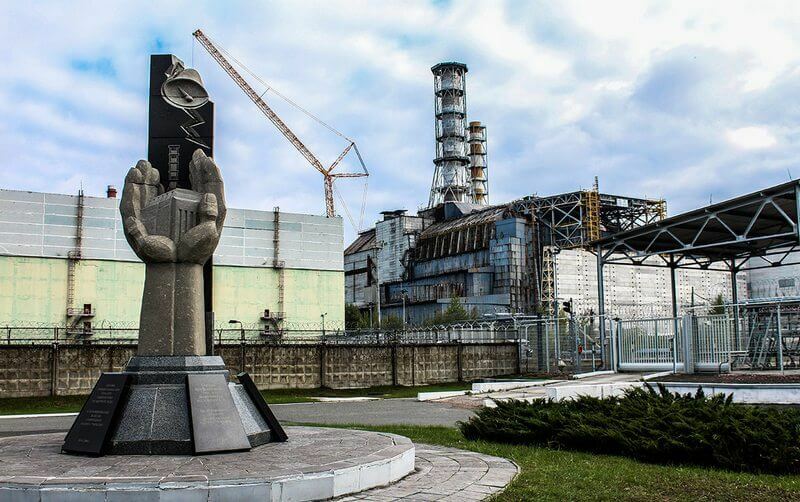 In A Biography of No Place I have a little epilogue saying this place was massively depopulated during the Stalinist period and in World War Two, and then it was finished off by this – again, progress and nightmare, with the Chernobyl plant. So that led me to that, but as time went on did more of a focus on the anthropocene. We know now that there are no national histories – everything is global. Goods are global, people are global, ideas are global, and certainly, something like radioactivity is global. So I’ve not seen myself as a Ukrainian or a Soviet historian, but a transnational historian. And the US features so largely in the Cold War that obviously it features in my histories too. There’s a deliberate moving away in the book from the tropes of Chernobyl history – the heroic ‘liquidators’ who fought the blaze caused by the explosion and may have prevented an even greater disaster, and the ‘Zone’, the official Zone of Alienation in northern Ukraine that was evacuated and closed-off in the aftermath, and although still uninhabited, now much visited and the inspiration for video games, films and much else. 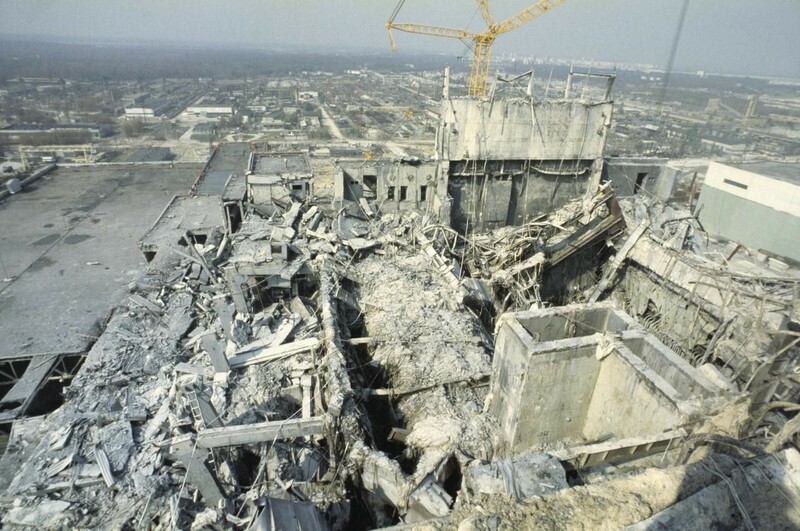 How did these become the ways in which Chernobyl was understood, and why did you avoid them? For a very deliberate reason – the accident story has been used to sweep all kinds of other issues aside. You say, ‘Chernobyl was the greatest nuclear accident in human history’, and then you play up all the drama of the seconds ticking down, the explosion, seconds ticking down, explosions, seconds ticking down, skin blackened, lots of mass heroism – and then it ends. It’s the world’s worst nuclear disaster, and only 33 people died. So we’re ok to carry on with our plans, and the status quo in terms of safety regulations – and this is at a time when all kinds of lawsuits came in like a storm at the end of the Cold War, because of testing of weapons, when downwind people were upset about their health problems, and were suing the British government, the American government, the French government and the Russian government. But also, you can take a tour of the Zone, as if it’s one discrete place – and in this book you expand it out, right across Ukraine and especially Belarus. Right. We’re told that contamination is safely contained within that zone – and you can take a tour and it’s perfectly safe! I once took a tour of a decommissioned Swedish nuclear power plant and they had us all suited up and tested us before and tested us after even though it was a super-clean place without dust or dirt – and even then two people in the group of four had to go and get cleaned up after from the radioactivity. There’s none of that in the Zone. What the Zone does is attract attention – ‘look over here!’ – and that seems too like another broom to sweep away a lot of the story. In fact, I found that right after the accident Soviet pilots went off to make it rain and made radioactive fallout fall on Belarus to save the big Russian cities like Yaroslavl and Moscow. So what you see if you look at the 1986-87 radiation map there’s this angry red spot around the plant; you skip over Gomel, a city of about half a million; and then there’s another angry red spot north-east of Gomel which is almost as radioactive as the area around the plant. 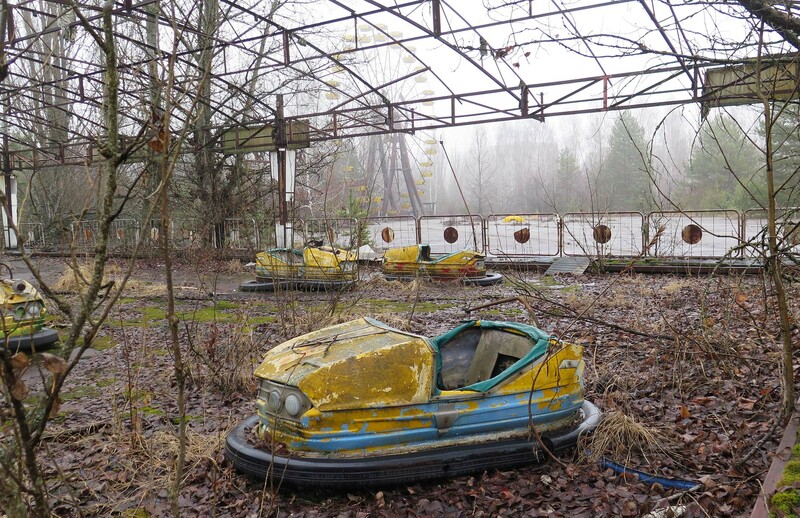 And that second Chernobyl Zone, no tourist ever gets to visit, people outside Belarus don’t seem to be aware of it. We have a place where people lived for fifteen years in an area of tremendous radioactivity. Early on in the book you describe going to the USSR in the late 1980s quite confident in the superiority of capitalism over Soviet socialism and of the west over the east. By contrast in this book there’s enormous respect for Soviet expertise and for researchers and activists in the Soviet Union and the countries that used to be in it, and their own interpretations of what happened. And this contrasts with figures like the biologist Robert Gale, who was treated as a hero despite making some very risky experiments in the aftermath of the disaster – and the common belief at the time that the Soviet research into what happened, published in a foreign language and following different protocols, was just trash. So the book focuses a lot on people like the doctor Angelica Guskova, the physicist Natalia Lozytska, and these people that are doing this quite sophisticated research and being constantly patronised and ignored. What I was looking for – which is very easy to find, because it comes right out in the archives – is these everyday heroes, who understood they were in real trouble and did something – they didn’t just go along with it, but went ‘stop’. There’s this guy Pavel Chekrenev who only lasted five years after the accident because he was so exposed – he saw that radioactive water was going from the Berdychev tannery into the Zhytomyr reservoir and he stopped production at that tannery, and he was in big trouble. But he said ‘stop, absolutely not, you cannot have radioactive water going into the drinking reservoir’. And I found people like Natalia Lozytska just started making their own measurements. She was a physicist, her husband was in civil defence so they had all these tools, and so they just went out, they drove round the countryside and took these measurements. She showed me these little pieces of paper, yellow, rudimentary Soviet stock, and she’d taped on these tiny little pin-pricks – these are radioactive dust particles – and then she went back day after day and recorded the decay. So that way she could tell what kind of isotopes they were, and what was the nature therefore of that event around 120 kilometres from where she lived. And she was one of the people who realised what we’ve known only since 2016, that the explosion in the plant was a nuclear explosion, that the radioactive fallout went so high in the sky, it went through the troposphere into the stratosphere and then it zoomed away. She was writing letters about that in the 1990s. Amazing. And she had to disguise herself as a cleaning lady in order to get into the first international conference on the effects of the disaster. She was hoping that the American would save them. Which seems very much part of that general late 1980s Soviet attitude towards westerners, the assumption that ‘they’ must be better than ‘us’. And then there was this process of disillusion. And you know what, I see two different silos of scientific thought that emerge in the Cold War. The American silo, and this is a gross generalisation, is, starting with eugenics, to focus more and more on genetics, to focus more and more on DNA, DNA repair, genetic damage, and that is a neoliberal trend in medicine, because if I can say ‘your problems, your cancer, are because you have a bad diet, you smoke and drink too much, you have terrible genes – well, it’s your problem’. We know that two thirds of cancers are caused by the environment. And the Soviets, who didn’t have to worry about liabilities, or big corporate sponsorship of medicine, they were aware that our bodies are far more porous and far more susceptible, that we’re a big lung breathing in and out our entire environment, and a good part of our bodies’ DNA isn’t even our own, it’s microbial. We realise now that our bodies can be damaged much more easily by our environments, but the Soviets were keen on that idea in the Cold War period. So of course they were like ‘yes, we know, radiation’s pretty serious’. Whereas the westerners who go there after the disaster, the main thing they know about Soviet science is Lysenko, whose work we all know is nonsense – but who you point out is actually quite useful in understanding some of this. It’s epigenetics! But at the time it was so easy to say Soviet politics is terrible, the economics are falling apart, so surely Soviet science and medicine are in the same camp and are also terrible. To say this was the easiest thing in the world, no-one was going to argue with you, you didn’t need to have an opposing viewpoint, you could just say ‘Soviet medicine is terrible’ and everyone would go ‘yeah, of course’. And at the same time a lot of people in officialdom whose reputation is not good, like Volodymyr Shcherbytsky, the Ukrainian Communist Party leader, who tried repeatedly to block the construction of nuclear power plants in Ukraine, and Anatoly Romanenko, the Soviet Ukrainian Minister of Health – these are the sort of dead wood that Gorbachev is trying to clear out, but they come out of your book looking a lot better than Gorbachev himself, whose main interest in what had happened was as PR to use it as a battering ram for Perestroika. Yeah. I don’t see Gorbachev in those early days going out to try and make sure these people are safe. You see him asking for more transparency in political and economic life, but not in terms of, say, publishing maps to show people where the radioactivity is, or helping the doctors who are treating these patients at the time, who have no idea what the levels are. There are a lot of urban myths about what should and shouldn’t have been in the Zone of Alienation, with some saying that Kyiv or Gomel were deliberately kept out of it – notoriously, children on the 1986 Mayday march in the Ukrainian capital ended up being taken ill with radiation sickness. You find a document in the archives where a KGB officer recommends that Kyiv should be put in the Zone of Alienation. And Gomel is even hotter, and much more in the line of fire. You do find the authorities in Ukraine deciding ‘right, we’ve got to evacuate all the kids this summer from Kyiv and all these other towns too’. Very little of that went on in Belarus, and so all the kids in Gomel just sat there, and the authorities in Belarus just said ‘that’s a Ukrainian problem’, even though it’s only three miles away, it’s so close – and that’s why there’s much more health damage in Belarus. As well as Robert Gale, a few western institution come out not looking wonderful; Greenpeace in particular may have been pretty hoodwinked by the KGB. It appears to have been. I think only David McTaggart of Greenpeace came in thinking they knew better than anyone else, but the rest had a healthy confusion – these people are very young, inexperienced, and they’re switched every six months so they have no institutional memory at all. And of the people that are there on the ground and stay – everybody who worked there said that the KGB had infiltrated their office but nobody thought it was them or could name who it was. There was one person there who was a good researcher, who did not dismiss the Soviets and started working with Soviet doctors and amassed a fair amount of data. That disappeared. But then you know, Greenpeace stayed, and I think what I tried to do with their example is show how hard it was to recouple these parts of Europe that were separated during the Cold War, and Greenpeace was really in the middle of that. And so was the World Health Organisation, so was the International Atomic Energy Authority (IAEA). Greenpeace have these plans to build fifty eco-houses outside Kyiv for those affected by the disaster, and never build them – whereas the Soviets kind of do build an actual eco-town for those evacuated from Pripyat – Slavutych, which you’ve described as the only actually liveable Soviet atomic city. It’s a nice city. So Greenpeace have these architect-designed houses which they’re going to build, and then they’re told ‘we can’t build them of wood’, which is a major export product in Ukraine. There’s so much miscommunication. As I implied I do think there was some deliberate sabotage, and as you say, I do think Greenpeace was getting played. You’ve accidentally found that the employees of a wool factory in Chernihiv were designated as ‘liquidators’, on the same level as the people that battled the immediate explosion, because they’d worked with a consignment of heavily radioactive wool. Could how you came across this? Well, so I walked into the archive in Kyiv in order to find the health records, and of course was told ‘there’s no such thing, that was a banned topic’, and I thought ‘well, I’ll have a look anyway’, and I pulled them up and it was stacks, this high, and I wondered why they didn’t know this was there; and I realised it’s because archivists don’t read, they pull records. Nobody had requested these records before. So I start reading, and I come across these 200 liquidators – that is, people who had a known dosage from Chernobyl and had helped with the cleanup, and that’s how you get subsidies and benefits, and this is usually firemen and so on, not women working with wool in a pretty clean town. I went out there to the wool factory complex and talked to the manager who said ‘yes we had a small problem it’s nothing and now it’s fine’. I asked to go down to the line and talked to a woman who took me down was middle management, and she said ‘I got here in 1986 and my friend who came with me died and I know she got a dose, and all those drivers too’. And that was a shocking story. These women were so touching – they’d look at the documents and say ‘oh, that’s my name, and that’s Svetlana, she’s been gone so long’, and they’d reminisce about the people they used to work with; and they had the most sensible things to say, unlike the management who had nonsensical things to say, with no memory of what had happened. In the late 1990s, the workers there lobbied to get that status because they’d worked with this radioactive wool, and that counted as taking part in the clean-up. The drivers got it at a high status and the wool workers a lower status, which made the management dismissive, ‘oh this was nothing’. You argue that there are two important frames for how the effects of nuclear accidents are assessed – the ‘builder of the atomic bomb’, General Leslie Groves’ attempts to minimise what happens after a nuclear explosion so that nuclear weapons wouldn’t be classed with chemical and biological weapons as banned ordnance, and then the interpretations of the tests on survivors of the Hiroshima and Nagasaki bombs. Anything which didn’t accord with the findings of the latter was generally dismissed. The Hiroshima studies are taken as the Gold Standard, and the reference point. If studies of Chernobyl don’t match that then there’s something that’s got to be wrong with those studies, because the Hiroshima study is so stellar. But there are problems with it, particularly because it starts five years later, in 1950. And Groves meanwhile is so concerned about chemical weapons that he wants to prove that a bomb just blows up, and that there’s nothing residual. And the baseline now is that a bomb explodes, and people die. But there’s also radioactivity and radioactive fallout, and that’s not taken into account in the Hiroshima studies to this day. So it’s five years too late, and a lot of the dose – which is a pertinent dose for most of us around the world – is not taken into account, just the bomb blast, although we are exposed every day to radioactive fallout in our ecosystem – some of us more than others. 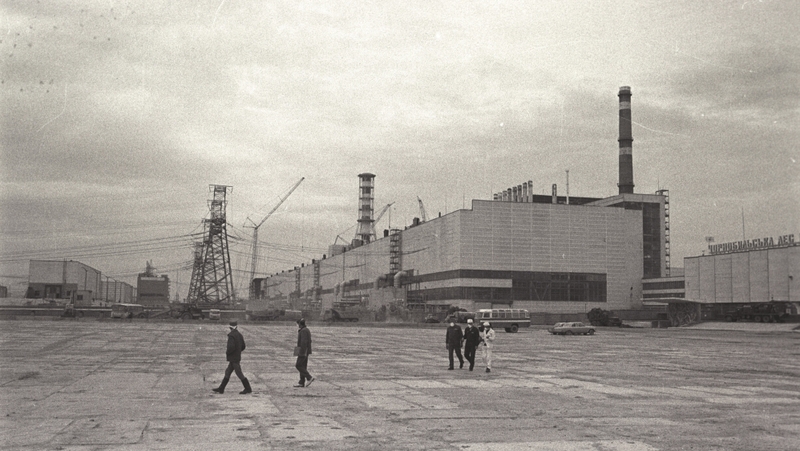 You also find an inextricable link between Chernobyl and the nuclear arms race, with engineers flagging up that the RBMK Reactors like those at Chernobyl were highly unsafe, but being overruled because they could be easily turned over to the production of weapons grade plutonium, specifically because of fear of a first strike because of Reagan’s ‘star wars’ plans. I was reminded in this part of the book about Tony Benn’s shift as energy secretary from a pro- to an anti-nuclear perspective as he realised that places like Sellafield were basically ‘bomb factories for the Pentagon’. Exactly – you can always quickly reprogramme it and produce plutonium, and that was considered useful. And you do not find those RBMK reactors in the other socialist countries, which were much safer and did not double-up in this way. It is easy to understand why the borders of the Zone of Alienation were drawn to avoid Kyiv or Gomel, given they’d have had to have evacuated millions of people, but you mention the massive radiation levels in Mogilev province in Belarus – why and how was this kept out? The first instinct, which is a perfectly good one, was to draw a circle around the plant, a little jagged in places and say ‘we’re going to evacuate this area’, and I find that to have been pretty responsible. The Japanese leaders over Fukushima weren’t a whole lot quicker – the Soviets get criticised a lot for taking 36 hours, but it takes a bit of time to evacuate thousands of people. But then they went out and did their homework, and mapped the landscape – and I find Izvestia doing this, a two-star general is doing this, and all sorts of Belarusians are writing into the newspapers – and then there’s a second Zone 80km away. In the 1990s Belarus starts to get a bit more serious about this and starts to measure it, and find out that in this province, nine years later, people are living with 40-140 curies a square kilometre. We consider it safe to live with no more than five. So these people were just in a stew. And that’s because the UN and the IAEA had come in and said no, the doses these people are getting are fine, and asserting that meant that there was no international funding. The Soviets were broke, though they knew they needed to get those people out of there, but they linger for nearly fifteen years, until 1999. The book has a lot of examples of both international and post-Soviet figures being very dismissive of the people who live in these contaminated areas, as being malignering, whining, dependent, and so on, in need of ‘shock therapy’. There’s this idea that these people don’t have chronic radiation syndrome, but they’re chronic welfare cases, that they’ve been on the Soviet dole their entire lives, who don’t know what life is like in the real world, and the real world is capitalism, where you work hard… and that to me is just such a travesty. You know how these people live and work. They don’t purchase anything, because one they don’t have any money, and two, they can produce it themselves. Everything they do is production, their lives are defined by it. And then (the disaster) makes that impossible. The idea these people were just malingerers, looking for a handout, is just really cruel – and it plays into this notion at the end of the Cold War that the west won. That was really damaging, and that was why I wrote ‘Why Kazakhstan and Montana Are Nearly the Same Place’, right during that period. But that was the ideological set of goggles that the west had on and so Soviet science was bad because Soviet everything else was bad, and these are like people permanently on the dole in Thatcher’s Britain or Reagan’s United States. ‘They just need to be dealt with with a firm hand’. And yet the people living there still obviously want to produce, and that’s how the agricultural production there ends up circulating around the world, with radioactive berries being put in small quantities among those that are safe. You quote someone who sells radioactive berries in Kyiv, who is first quite defensive about whether or not her wares are contaminated; and then she says ‘well maybe there is Chernobyl here, but it’s all ours – a person adapts’. So much of what is going on in the book is about this idea of how Reactor 4 at Chernobyl has become part of people, has seeped into their bones. Yeah, that defines them in a way. What I found was a real resignation to that fact, but also a fatigue about constantly being reminded and being defined by it. People don’t want to be seen as ‘oh, you’re a Chernobyl person’, and that being the limit of who they are. At the same time they have to admit it has irrevocably changed their lives and become part of their bodies. My critics are claiming that what I’m saying is it’s incredibly dangerous for us to eat Chernobyl berries, but what I was trying to say is that it’s way better for people in New York or London to eat those radioactive berries than it is for those people. That one solution is, yes, to send them around the globe, but another solution would be to just bury them. 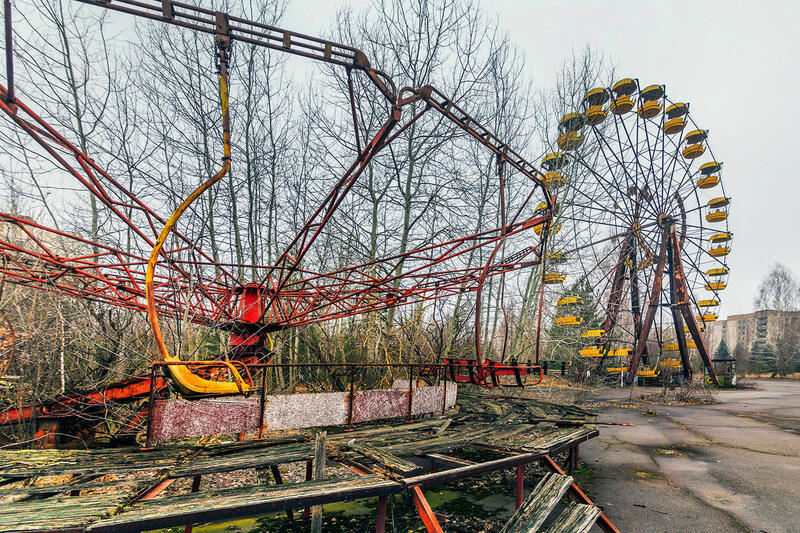 For you Chernobyl is an ‘acceleration’ more than a singular event, in the context of the nuclear tests of the 50s and 60s and the radiation thrown up by that. We all live under the shadow of the mushroom cloud, yes – but some people more than others. What I couldn’t understand was, why would the UN and international actors and the Soviets want to cover this up, what dog did they have in that fight – and then I realised that there were these lawsuits, which I’d written about in my book Plutopia, which in the United States cost billions and billions of dollars, claimed by the people who were zapped. The United States was the only country to have the stupidity to do nuclear testing in the continental heartland. So as the fallout goes up, it doesn’t land right around there because it’s a desert, but as soon as it starts to rain it goes north and east and comes down as radioactive fallout. So one of the hotspots of radioactivity from the tests in Nevada was Minnesota. The authorities have no idea about this, and no idea why people can’t reproduce in the same way, and some farmers get suspicious and are shut right down by the US government. So the American administrators in the atomic energy department have a real track record of classifying information, not being terribly curious about how much radiation is leaving their nuclear centres, whether it’s a bomb site or a power site, and slandering scientists – when they to hire scientists who draw attention to this they fire them and slander them – and hiding evidence. For instance after 1945 Japanese scientists go in and make measurements of the radiation after Hiroshima and Nagasaki, and their measurements are confiscated by the occupying US army. We still to this day haven’t found those records. So we have no live data about what radioactive fallout was like immediately after those bombs. We do have that data for Chernobyl. So Chernobyl records are important. People like big round numbers and body counts in popular histories of the Soviet Union, and you seem to deliberately avoid that – you rightly ridicule the official figure that 54 people died as a result of the accident, but beyond that, you don’t really give a figure, and seem to argue that it’s unquantifiable. Well, how you can you quantify it when there’s been no monitoring? The Japanese bomb survivors were after five years located and put in a record. That hasn’t been done. Because the international experts came in and backed up those Soviet experts who said we don’t need a record, every time we have a nuclear event – from Fukushima to the burning radioactive waste that was discovered in St Louis, we’re told ‘we don’t know much about low doses of radioactivity, give us time and we’ll study it’. It’s been so many years, since 1945, and we apparently don’t know. But you find that lots of these documents do exist in the archives, but they’re in Russian and Ukrainian. What’s interesting about these is that they all have ‘for office use only’ on them, so this was supposed to be kept in a safe, locked up – and these scientists were strongly discouraged from reporting bad news. The Soviet Union was meant to be getting healthier and happier every day, and so you don’t want to send your bosses bad news. One thing that you see with Belarus is that they do compile reports that list these things, but they have the headlines ‘No Problems, No Changes’, and that’s very funny and ridiculous – but it took great courage to come out and make reports that showed damage over time. So when I see scientists doing that, I give that work credibility. But I was also thinking around the 2016 election and Wikileaks and all of that, ‘maybe things have been planted here for me to find twenty years later’ (laughs), so I didn’t know how I could cross-check this story, so I decided I’d just go and follow these two biologists and learn as much as I could about it, and took a tour of what I thought was a clean part of the swamp, which turned out to have been radioactive even before Chernobyl was built, and went undercover berry-picking and found radiation monitors and doctors, and tried to cross-check the story against the natural world. And I learned that you can look, if you’re trained, at the edge of a forest in southern Belarus and see what is like the imprint of a hand gripping and twisting the trees so that they look palsied. And you can realise that if a radioactive cloud hits a forest, the edge will get it more than the interior. In terms of numbers what I was trying to do was take 35,000 deaths as a minimum – 35,000, not 35 – which comes from official Ukrainian payouts to people who have lost their spouses due to Chernobyl exposure. These are people who are old enough to get married. There’s a lot more, as that doesn’t count children, or those who are unmarried. Ukrainian officials if you talk to them think it is around 150,000, and I couldn’t get Belarusian figures at all. Kate Brown’s Manual for Survival: A Chernobyl Guide to the Future is now available from Allen Lane. Owen Hatherley is the author of several books on political aesthetics, and the culture editor of Tribune.